Labor and Parts: Our service coverage includes all replacement parts and engineer labor that are needed during your rental term, with the exception of damage and repairs due to negligence or misuse. Preventive Maintenance: Periodic visits for routine maintenance will be scheduled for dates and times that work for you. Keeping a regular maintenance schedule is one of the most effective strategies for maximizing your rental system's uptime. Uptime Guarantee: An uptime guarantee is a promise that your rental term won't be spent waiting for solutions to equipment issues and failures. Our service team offers an uptime guarantee of 98%. 24/7 Call Center: Block Service Coordinators are on call after hours and will schedule an engineer to come to your facility as soon as possible. If your call isn't answered right away, leave a message for a quick call back. In the event of an equipment service issue, our first step is engineer phone support. If an issue is relatively simple to resolve, a phone support call can be the fastest way to get your rental system up and running again. If phone support isn’t enough, there are a few factors that may affect service response times. Facility Location: If your facility is in a more remote area, field service engineers may have a longer onsite response time. This may also mean later delivery times for replacement parts. Field Service Engineer Location/ Availability: The number of field service engineers that work on certain systems may be limited in your area which may affect onsite response time. Facility Availability: Working around a scanning schedule or limited facility hours will affect onsite response time. Mobile delivery drivers do their best to transport imaging systems as smoothly and safely as they can. Sometimes though, the equipment needs extra care and time to stabilize after travel. The first month of rental is a period in which you might need more service than usual. Our customer service representatives and field service engineers are available and ready to work with you to make sure the first month hitches and hiccups are worked out as quickly as possible. Should you need to place a service call during your rental term, there are some pieces of information that will help your service rep process your request faster. If you can call with the following in hand, it will save time on the front end of your service case. Is the system hard down, or is the issue intermittent? When is the system available for service? 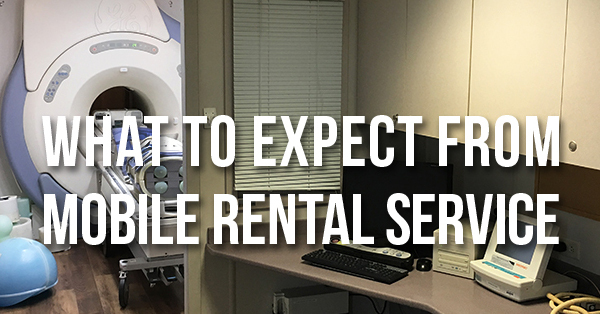 While there are a lot of differences between renting a mobile imaging system and having one installed permanently in your facility, the quality of your service coverage doesn't have to be one of them. Many rental providers, Block Imaging among them, offer full-featured service coverage for the duration of your rental term. If you'd like to know more about equipment rental and service, you can use the button below to browse our mobile fleet and contact us with your questions.